Today, the wedding program has become functional with the most practical use being a fan. This newer trend provides your guests with the traditional info that a wedding program delivers with the added benefit of being functional. Tradition + fun, what could be better? Follow along and we’ll show you how to make wedding program fans as well as how to decide which style suits you best! 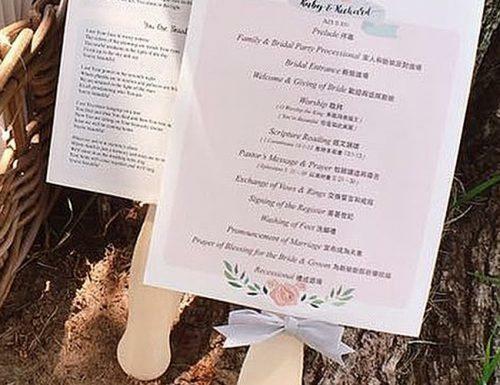 How Come Wedding Programs Double As Fans? It used to be that wedding programs were strictly printed pieces of information to guide guests through the day’s activities. Over time, the simple piece of paper became more elaborate. Couples started adding color, images, ribbons, and lace. Today, the wedding program has become functional with the most practical use being a fan. Why? Picture the last time you attended church. Although ceilings are high and rooms are spacious, the number of people in the room make heat things up fast! Or, imagine a gorgeous outdoor wedding. The flowers are blooming and the sun is beaming down on the entire audience. In both cases, things can get way too hot! A slight discomfort is enough to justify providing your guests with a fan to beat the heat. The last thing you want is for your guests to remember how hot it was and how thankful they were to escape the scene. You put far too much hard work into this ceremony and reception. Don’t let the sun or insects undo your diligence and preparation. Give them a fan to keep themselves cool and fend off the insects. It may be a little extra effort or money, but you’ll certainly be glad you did. The best wedding fans ideas are so worth it! Although your creative focus is on constructing a functional way to beat the heat, the details of your wedding program are an equal priority. There’s a little flexibility to add your personal flair, but this sample of wedding program is best practice. 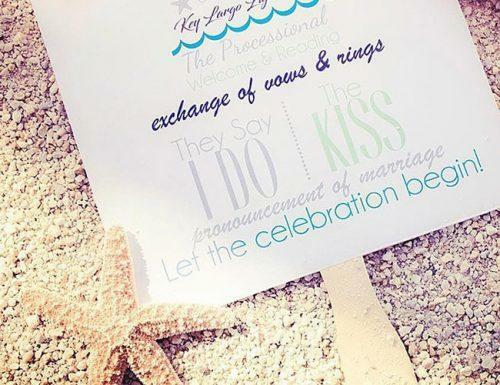 If any of these items don’t apply to your ceremony do not include them. Just the same, if there are any hallmarks that we haven’t mentioned make sure to include them where they fit in. The goal is to inform your guests so that they aren’t late, they aren’t lost, and they can actively participate in all the fun. Modern weddings are updating this classic must-have list to include social media and devices. A lot of your guests will be snapping photos all night long. To help them share include your hashtag, website, and social profiles where your guests can upload. There are 3 basic styles of wedding ceremony fans. The most difficult is the partial circle. This makes setting your text a little awkward and spending extra on a special cut at the printers. We don’t recommend this. The other 2 styles are great! They both provide DIY or purchase options and are really versatile when it comes to style and theme. 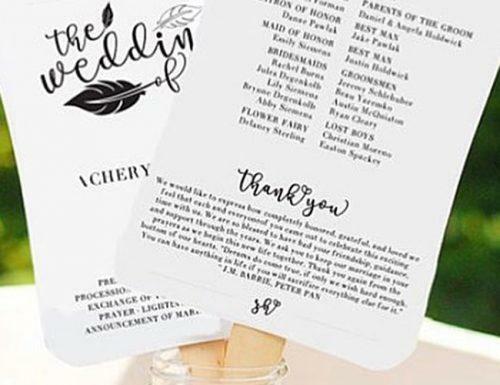 These wedding program hand fans can either be a standard wedding program mounted on a handle or, thinner program pages that are held together and pivot at the bottom. The first option allows for a more traditional format. If you plan on a classic church wedding this is your best bet. You’ll fit all of your crucial details into the format that’s expected and will modernize traditional designs while not straying too far. Great balance. Another great balance is the ability to choose from a wide range of templates out there from sites like downloadandprint.com. Do It Yourselfers should note how important it is to choose the right materials. Too big and your guests while find themselves fumbling with it all night. Too light and it will come out flimsy. If you’re interested in beach wedding program fans for your outdoor boho wedding, folding wedding programs are just right for you. It collapses to easily fit in a clutch or pocket, and it delivers a new dimension of creativity to work with. 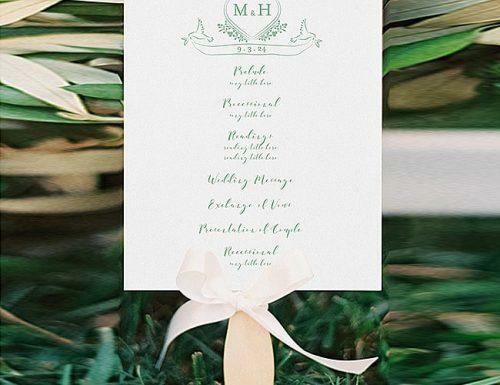 These are not your traditional wedding program formats so you’ll have complete flexibility with colors, shapes, and layout. Binding at the bottom can be a ton of fun too. Look to your craft store for unique grommets, ribbon, or rustic twine depending on your taste. 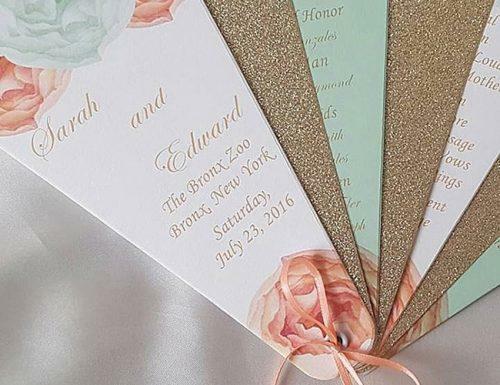 There are a few occasions where you’ll be on the fence about turning your wedding program into a handheld fan. A mid-summer beach wedding is not one of those occasions. You pretty much have to. Beach weddings have a lot of character. Use this to your advantage by bringing your custom wedding fans into your wedding theme. This can be achieved by working a beach-like color scheme into your layout, or by taking a step further and cutting the fans into shapes like seashells or applying small floral details. The presentation is important too. 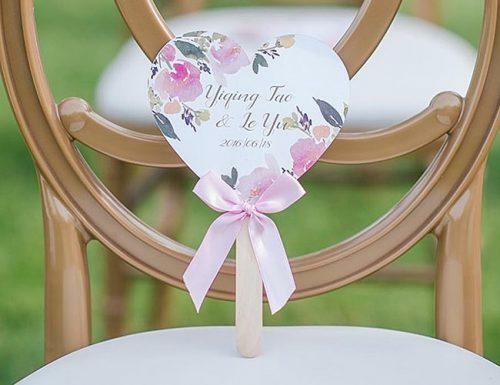 It’s entirely appropriate to leave a personalized wedding fan on each guest’s seat. This looks nice and makes sure that everyone gets one. Alternatively, many couples handcraft a decorative box that’s left at the entrance for guests to grab as they enter. Rustic wooden boxes always leave a good impression. Or, consider a clear plastic container to let those colors pop! Even couples with generous bridal budgets will want to get in on the DIY action. This is one of the biggest moments of your life, and you’re sure to want your personal touch added to as many details as possible. The first step in a DIY project such as this is to make it social. Call a few of your besties over for a small party. Serve a few hors-d’oeuvres, pop a bottle of chardonnay, and get the assembly line started. You’ll want to have your programs printed on proper cardstock, your fan handles laid out, and all of the accessories ready to go. You should also strongly consider finding the best YouTube tutorial and get a few practice assemblies out of the way so that you can perfect the process before your guests jump in. Anyone who’s ever made something by hand knows just how rewarding this can be. Forming an idea in your head, planning the steps, and finally seeing the fruits of your labor makes the end result personal and fulfilling. This is an important notion to consider when deciding between DIY wedding program fans and purchased. There’s always going to be an expense, but there are a few ways to minimize this and keep your wedding program fans cheap. Doing it yourself will certainly save some dollars, especially if you’re planning on an uncommon shape. Die Cutting is one of the more costly things to cover with the printer. If you’re working with a budget DIY wedding programs fans are definitely the way to go. Hot tip for classically themed weddings! Instead of springing for specialty paper, buy regular paper and age it yourself. Find a nice sized tray, dilute some instant coffee in plenty of water and dunk the paper. It’ll come out looking authentically ancient, and once it dries you can print and write on it just like normal. Be careful when printing out your templates and designs at home. It’s important to choose the right paper to get the best color and work well as a fan. But, not all home printers will do well with thick stock. Before you commit to buying dozens of sheets and calling your friends over for a DIY night, make sure it will come out exactly as you’re expecting.